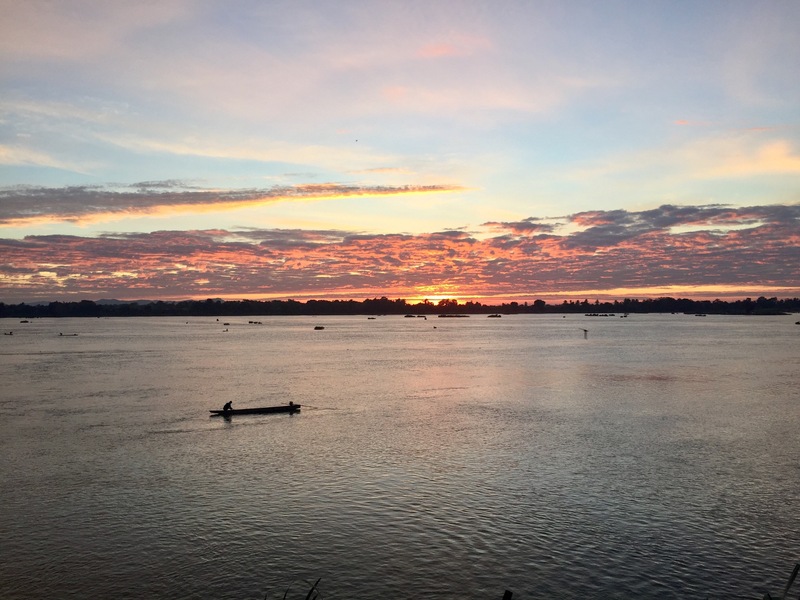 Danielle woke me up this morning at 5:45 to watch the sun rise over the Mekong. We watched at first from the large terrace on the second floor of the guesthouse and then moved to Mali’s patio across the street, right on the river. It felt like our vacation was just then starting. 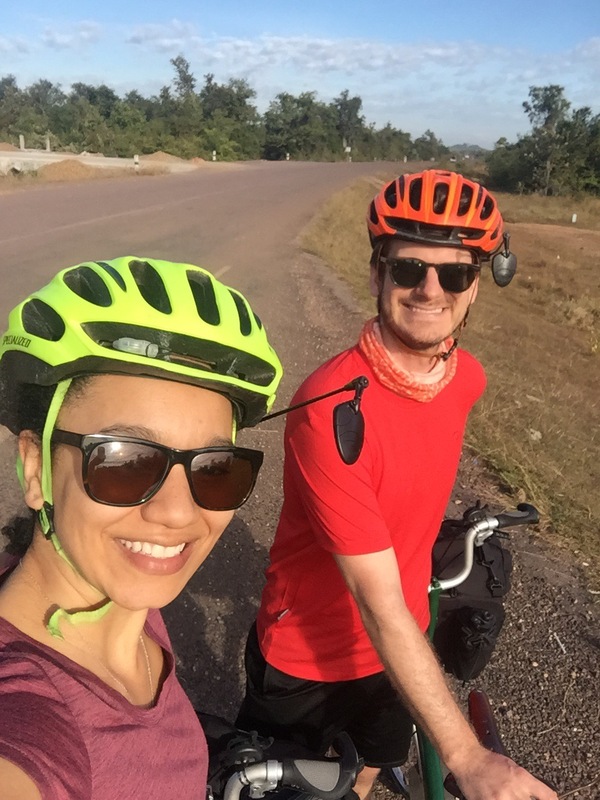 Siem Reap had its ups and downs, but we came to explore Laos, and now we were just getting started. After the sunrise, we packed up our things and then rushed downstairs to have one more amazing meal with Mali. 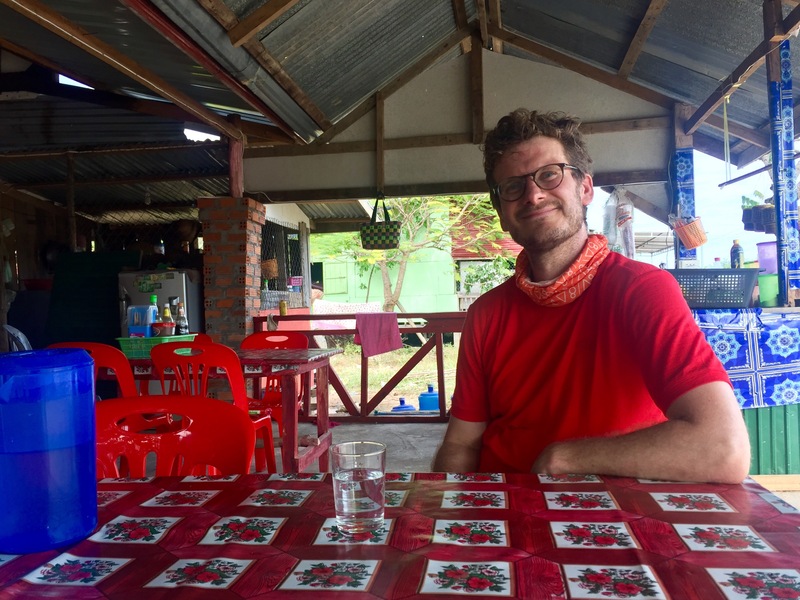 This morning it was an omelet with fresh vegetables and mushrooms grown by Athalo and Mali themselves (“I come here to detox, I want to know what is going into the food I eat”), a fresh baguette, and local Laos coffee. Also, Mali brought out her personal stash of Nutella to share with us. So kind! After breakfast, we filled up all of our water bottles from the water cooler in the kitchen. This wasn’t insignificant, because tap water isn’t always safe to drink, so filling up 5+ liters of water saved us from buying 5+ liters of water on the road. This was yet another act of kindness from Mali (“Don’t thank me, thank your personality”). And then, in the biggest, MOST AMAZING act of kindness yet, Mali and Athalo offered to drive us from their guesthouse to the main road on the mainland, saving us from the choice of either spending money and dealing with the hassle and delay of finding a boat to take us across the river or adding an additional 15k to what was already the longest ride of the trip. 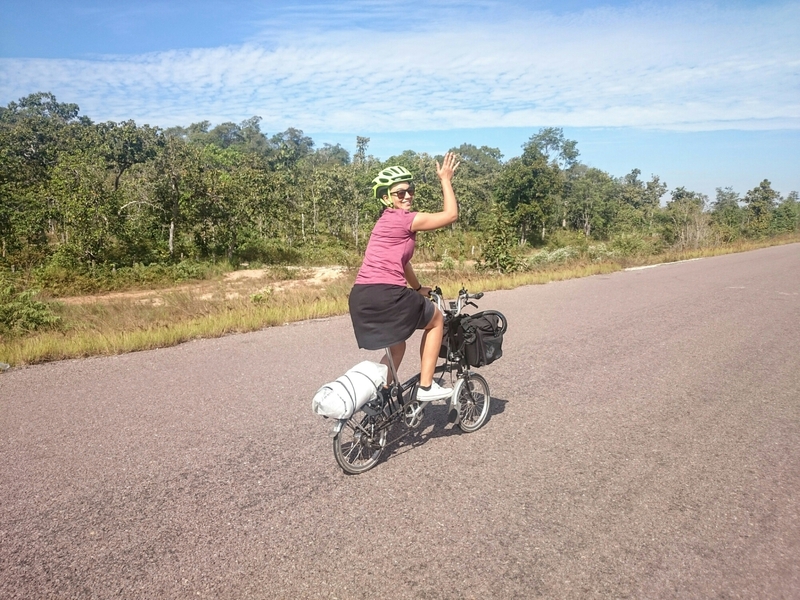 We gratefully accepted, and at the end of the ride they gave us big hugs and watched us ride away, waving at us and smiling like they were our adopted parents. Ok. Enough about Mali. We’re finally riding! This was supposed to be a bike tour after all! Like I said, this was the biggest ride of the trip. We were hoping to ride 106k, or about 66 miles. That would have been nothing at the end of our last tour, but neither of us have been riding a lot lately. The beginning of the day was just lovely. We lucked out and had a relatively cool day (in the mid seventies instead of the upper eighties), so we weren’t suffering too much… at least not from heat. We were facing a consistent headwind all day, but it was pretty gentle; it was nothing at all like those headwinds in eastern Montana. 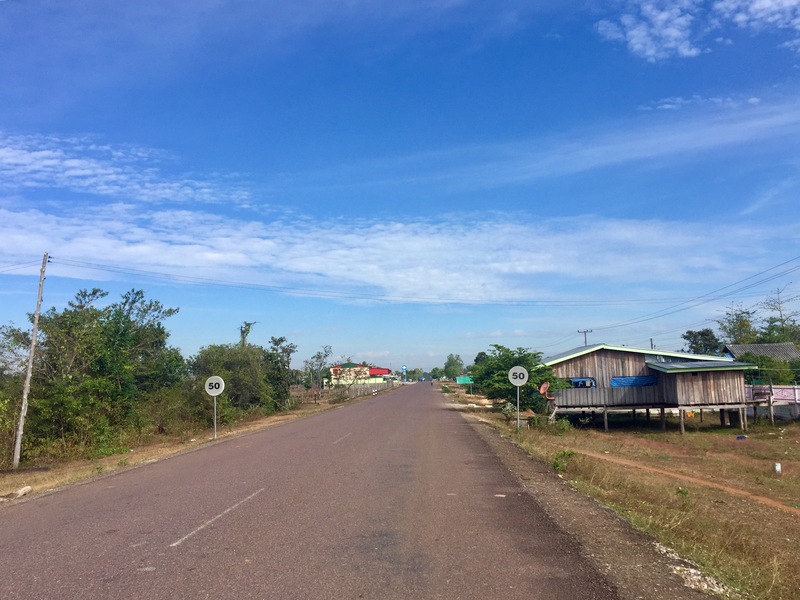 The road (Route 13, the main/only north/south road in southern Laos) is in great condition, and traffic was incredibly light. We probably had to deal with more cows than cars in the road for the first 20k or so. The countryside reminded us a lot of Zambia. 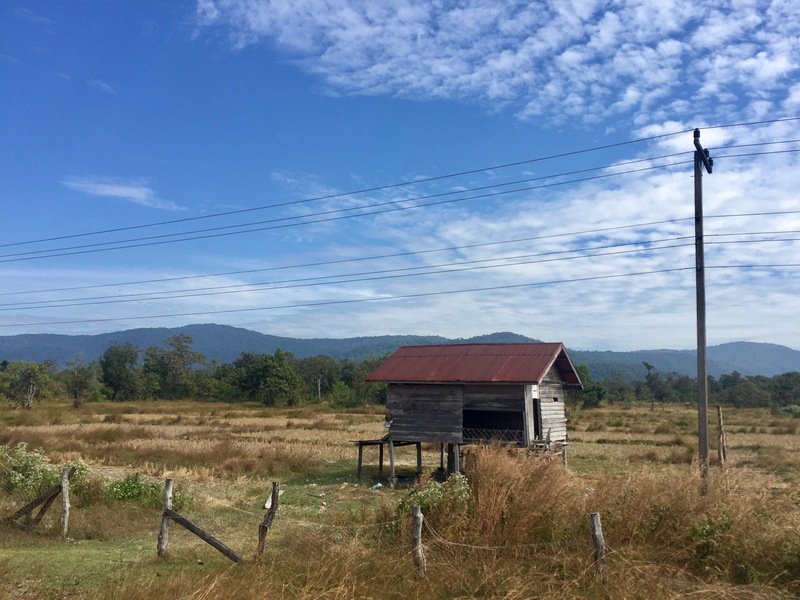 There were fields and rice paddies, and a few fish ponds too. There were very few large trees, and large numbers of roadside shops all selling the same things. We also saw an interesting mix of housing. 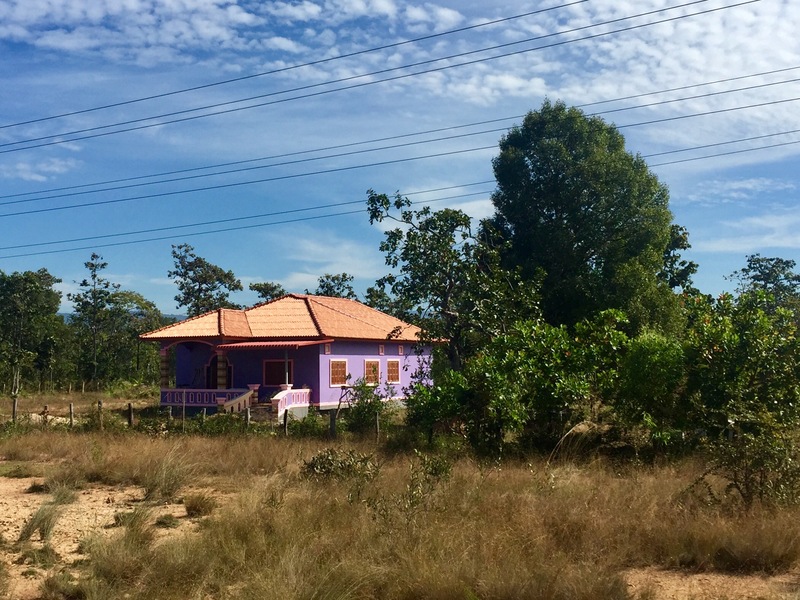 Often more run down houses were side by side with newer, beautiful french colonial houses. The traditional style of house here is built on stilts, and often families were gathered in the shade underneath their houses, processing their crops and sometimes just hanging out. Every time we passed a group of people they would smile and wave. Children would run after us, waving and yelling “sabaideeeee”, which means both hello and goodbye (noteworthy because the kids who chose to greet us in English often went with”goodbye,” and watching a kid run out to greet you yelling “goodbye, Goodbye, GOODBYE!! !” was pretty entertaining). I love riding my bike through a new area! 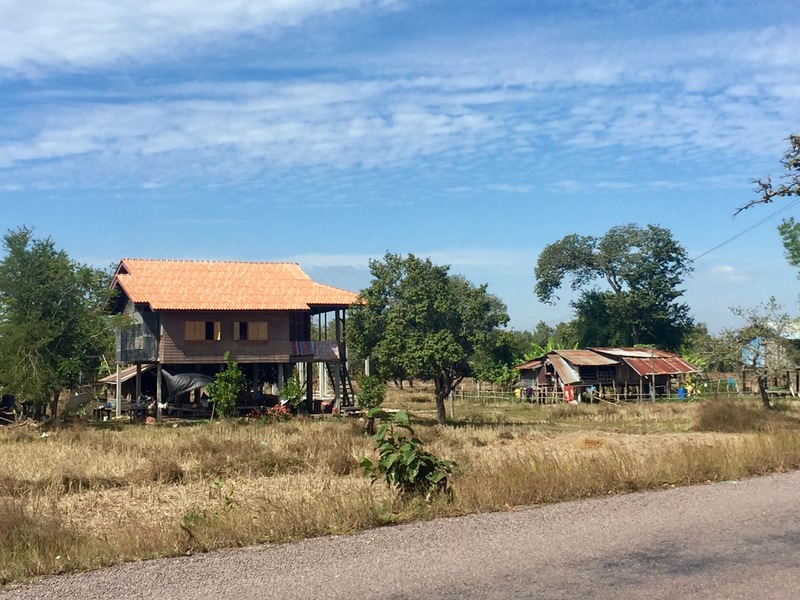 After we rode about 40 miles, we decided to stop for lunch in a small town named Huay Keua. 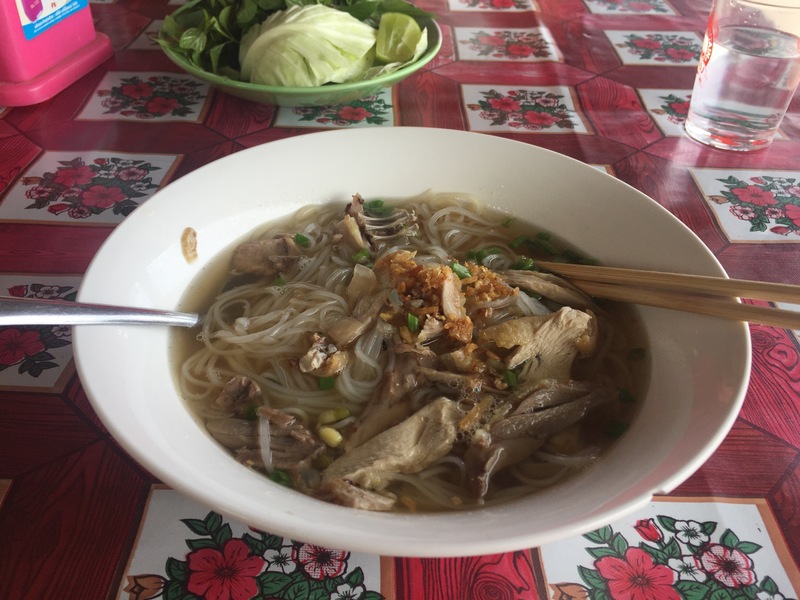 We pulled over at a restaurant looking place (although they also sold clothes and cut hair), and when the proprietor spoke to us in Lao, Dani greeted her and then mimed eating out of a bowl. The lady smiled broadly, and a few short minutes later we had a couple of big, steaming bowls of delicious chicken pho. As we chowed down, the owner came out of the back with her toddler son, who had apparently just been given a bath by his grandmother. He was our entertainment for the rest of the meal. He was very interested in us, running up to touch us on the leg and then running away as if on a dare. He also tried to take a swig from a bottle he filled with rocks and spent a while playing with a stool and pushing it around the patio. Who needs toys when you have all these random objects to play with? After lunch, we had about 23 miles to get to our ferry across the Mekong, and like they always say, the last 23 miles are the hardest miles. It was hotter, the road started going uphill, we were more tired, and traffic had picked up (although most drivers were incredibly considerate, at times following us at 10 mph for minutes until it was safe to pass). And our butts hurt. So we rode slower, complained more, and took more breaks. 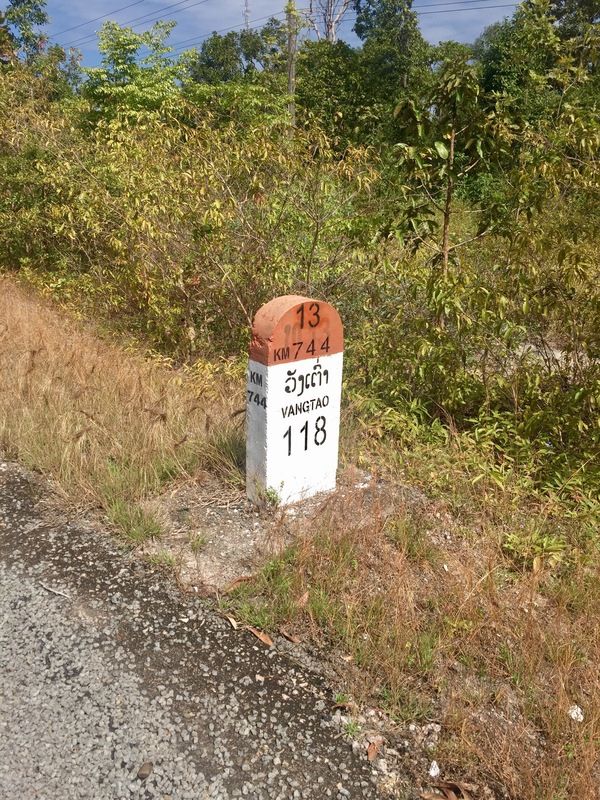 But eventually we made it to our turn off to go down to Ban Muang, where we could catch our ferry. What sweet relief this side road was. 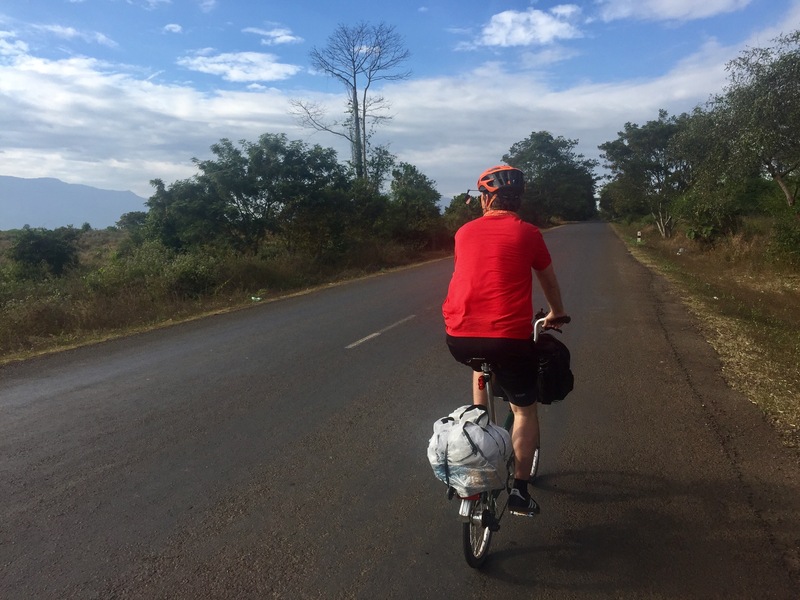 No headwind, no traffic, and downhill to the Mekong. We rode into town and straight past our turnoff, but some kind townies shouted at us and let us know where to go. 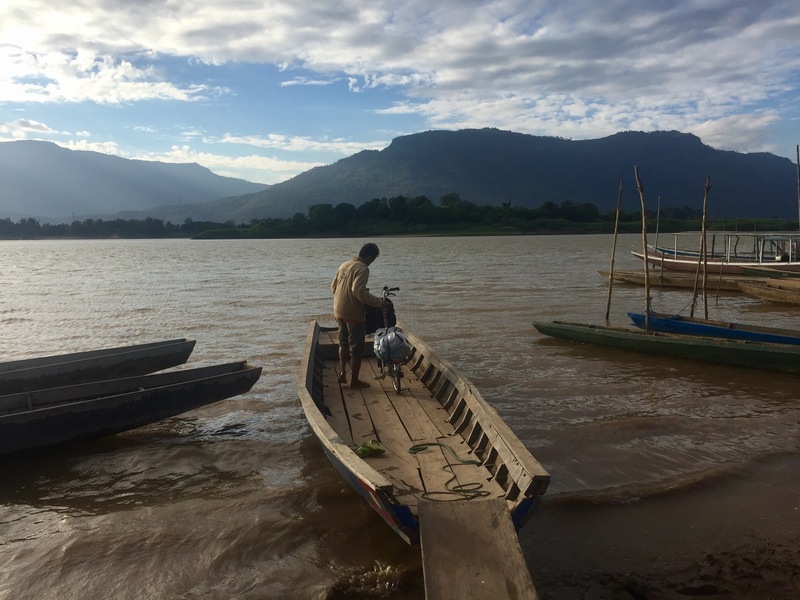 We went down to the edge of the Mekong, where the people shocked us by telling us that the ferry crossing was 70,000 kip (~$9) each. Or so we thought. 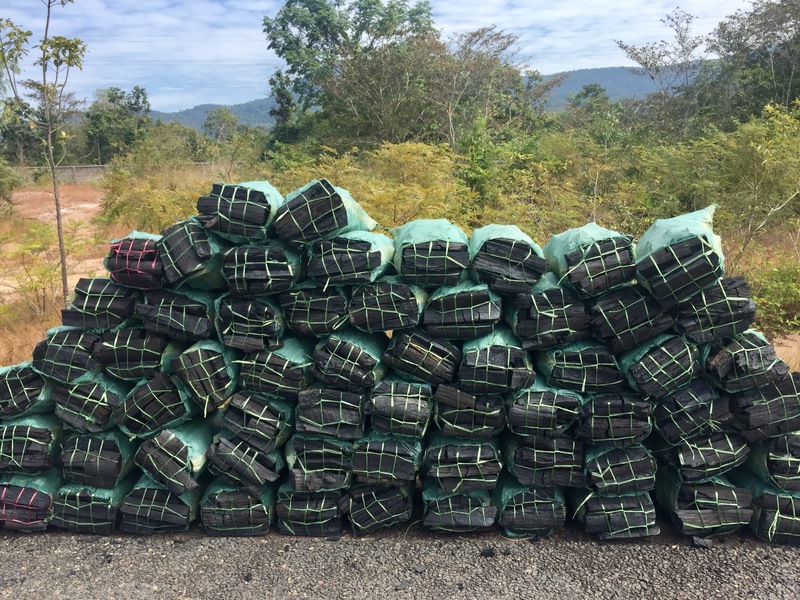 Turns out the Lao word for twenty sounds a lot like the English word seventy. So the ride cost $2.50 each. Much better. The ferry ride was an old rickety boat with the operator, us, our bikes, and one other passenger. It only took us about 7 minutes to get across, and then, after pushing or bikes up the hill, we set off find our guesthouse. Turns out it was in the wrong location on the map we had, but a kind lady selling street food stopped me before I tried to enter what was–in retrospect–obviously a private residence. A mile or so later, and 67.5 miles in total (kinda, that counts the ferry), we found our actual guesthouse, Khamphouy, where we paid $10 for a basic room that had everything we needed, but not much more. We showered (hot showers was one of the things we decided we needed), and then headed out to find food before collapsing in bed around 9pm. Tomorrow we explore Vat Phou, a thousand-year-old temple built at the base of a mountain just off the Mekong. ps. Dani made a video! Check it out for a taste of our trip so far. It has a few clips from today. . . and from tomorrow – time travel! Happy New Year! Enjoy your trip and stay safe. Love you! Thanks, and happy new year to you, too! Love you! !